Energy efficient homes are designed with Mother Nature in mind. These “Green” homes are designed while considering the impact of the building materials on the environment. By using natural resources, recycled materials and new technologies, you can use environmentally friendly approaches when building a home from start to finish! So what sets these plans apart from ordinary plans? 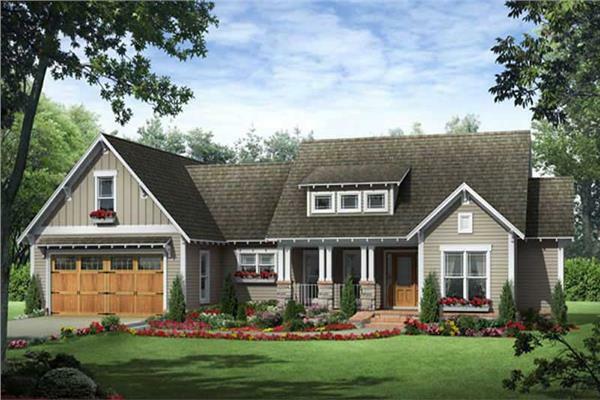 These environmentally friendly house plans have simpler designs and make use of every square foot of the home. This helps to reduce waste, while building and after it’s built, without sacrificing style or comfort. Many times, they are also smaller in size, even tiny, though you can still have a larger house with a “green” home design. Many of these homes use extra-large windows or walls of windows to incorporate natural lighting to help heat in the winter (see also Passive Solar House Plans). Conversely, some of these designs implement strategically placed overhangs to provide shade to help cool your home in the summer. Use appliances that have a high energy star rating. When finding new building materials, look for recycled or repurposed items. Make sure your walls and ceilings are insulated. This will help keep you cool on hot days, and warm on cold days. If you're not sure how to start transforming your house plan into an energy saving oasis, be sure to add the Energy Efficient Details Sheet to your order (available when adding a product to your cart) … it's a great way to get started! Browse through our selection of eco-friendly house plans below, and contact us with any questions you may have!